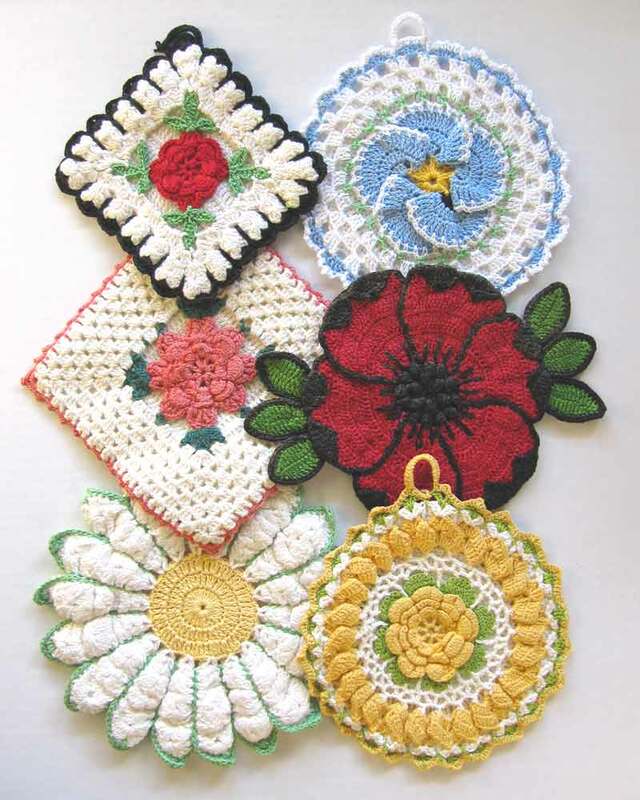 Vintage Potholders are sure to remind you of a simpler time. The first all-potholder leaflets came about in 1941, complete with stitch instructions and patterns. This was a classic time before television: when the family would gather around a radio, listen to music and entertainment while a mother could enjoy crocheting and knitting in the company of her family. The kitchen being an important, if not the most important room in the house, needed to be exquisitely decorated and complete with color. Red, particularly Mandarin Red, is said to be one of three colors to first appear in kitchen decor. Red is bold, represents prosperity, reputation and is said to appeal to the appetite. Sunbonnet Sue is so cute and you have to admire the frilly feature in the brim of her red hat. She’s a classic fit for any kitchen. The red and pop of green complement each other perfectly. The black really outlines the detail of this pattern and enhances the design. Blue is also one of the original colors offered to consumers since its introduction in 1927. Blue is said to being a calm clarity to its admirers. It is great for relaxation and renewal making it a classic color choice for kitchen decor. 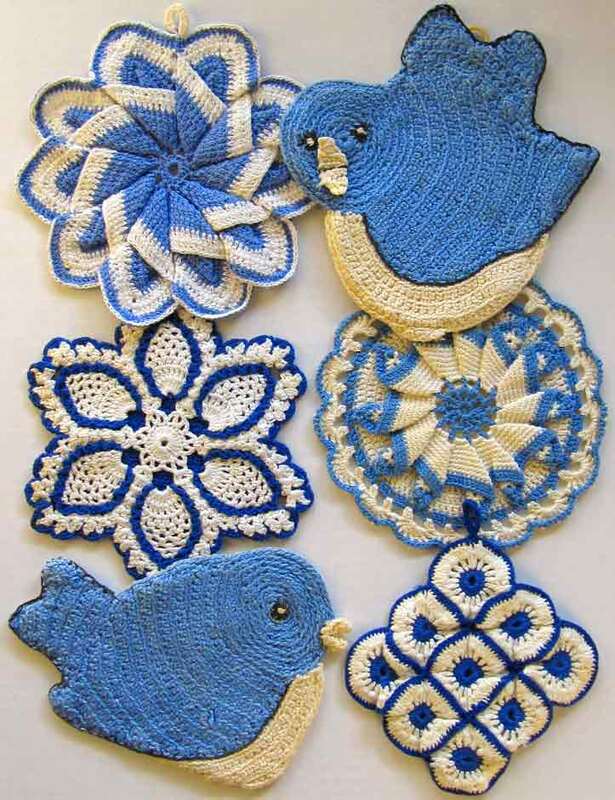 This unique little bluebird is a fantastic way to welcome the spring air into any kitchen. The fine stitch pattern throughout his body really acknowledges the time and talent it took to stitch him up. 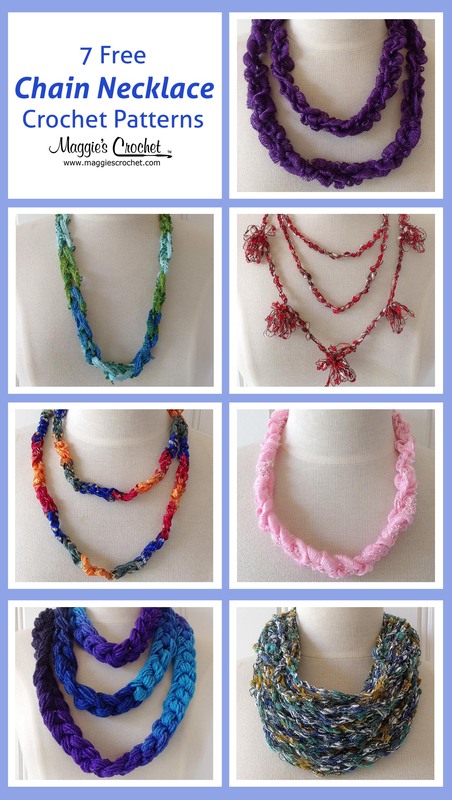 This collection involves an array of color and texture. Because blue has many values, you are able to choose the shade of blue that matches your kitchen best. When it be lighter, darker, more turquoise or somewhere in between. 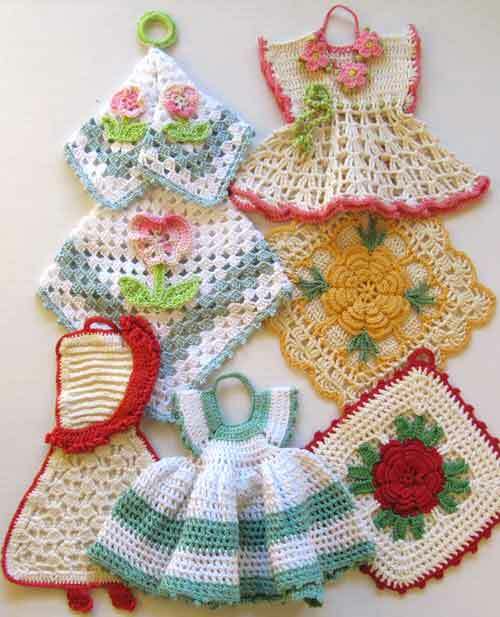 As you can see with this vintage collection, although no two potholders are alike, they come together to form a beautiful union in the kitchen. 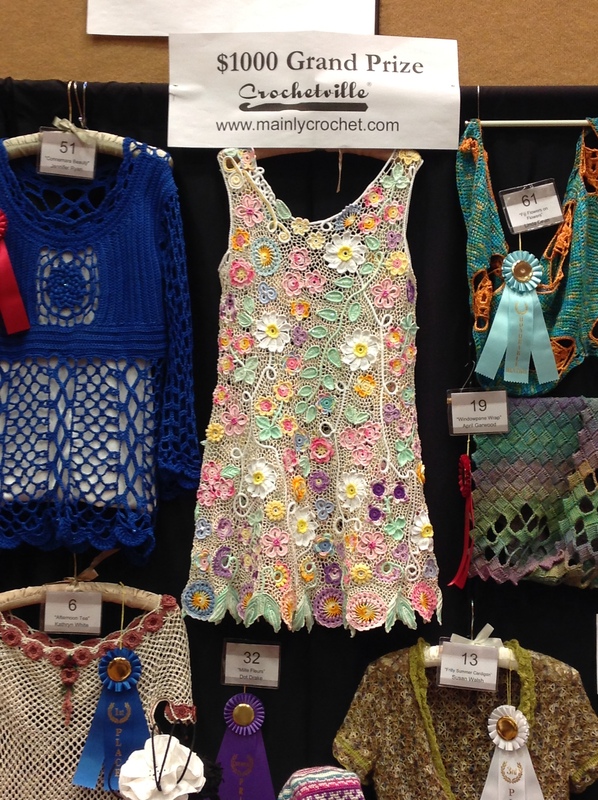 We can thank these colors being used together in vintage patterns by creative designers. Because they were the first official colors of kitchen decor, crocheters and knitters needed to adjust them to make them work well together. 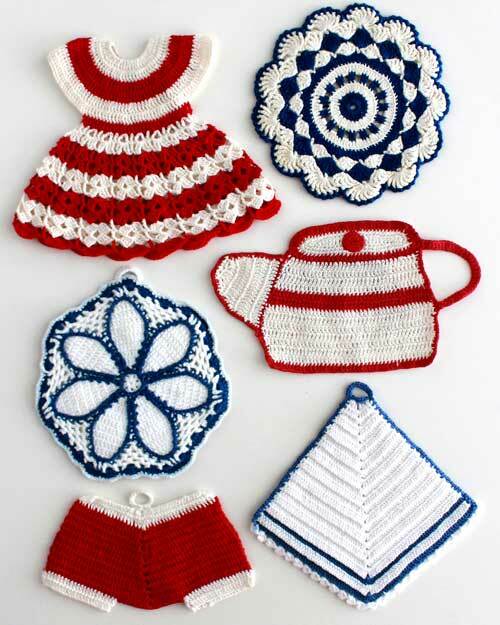 These vintage potholders signify a classic color duo which is still in style and found in a lot of kitchens today. The bright reds and dark blues complement each other perfectly. Using familiar items like a dress, flower, and tea kettle brings us back to days at our grandmother’s house. Truly inspiring and retro! Although these may be vintage, they still represent the patriotic nature of today.